Summer is here, full on. 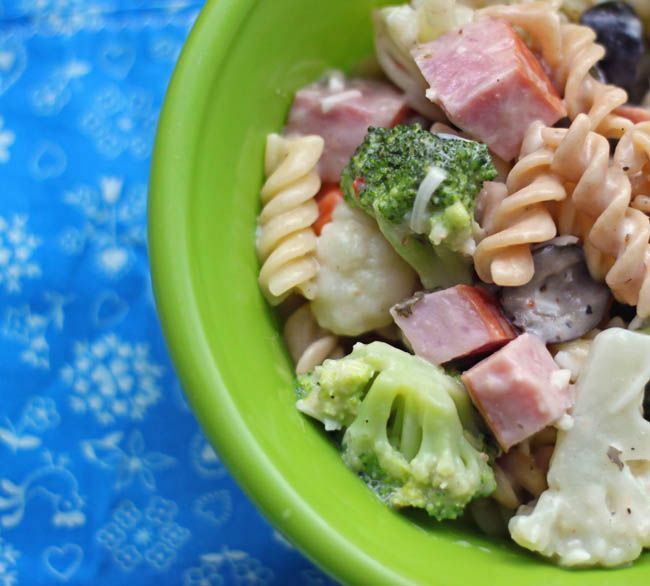 And Pasta Salad is one of my favorite go-to's in the summer. It's quick, filling, nutritious, and even my kids will eat it. I use whole wheat pasta for added nutrients. Cook according to the package directions, and in the last three minutes of boiling toss in a bag of frozen California style veggies. When it's done, drain well and run cold water over it to cool the pasta. While it's cooling, chop up ham into cubes. Halve black or kalamata olives as well. I use store bought dressing - a mix of Greek Vinagrette and Creamy Italian. Just eyeball it, tossing occasionally to make sure your pasta is coated well. When you have enough dressing, add in a little fresh cracked black pepper, fresh grated parmesan, and about a teaspoon of Cavender's Greek Seasoning. Stir it well and enjoy! You'll spend 10-15 minutes in the kitchen, at the most. By the way, I loved the questions you guys gave me! I'll get to those soon. Like when I have internet access. Which I don't right now. It's a huge inconvenience, but we'll get it all done soon. Life on the farm is going so well! I'm enjoying it even more than I thought I would. Mornings and evenings are magical. Oh does this ever look and sound sooo good!! I love the easy peasy part too!! Thanks so much for sharing! I will definately be giving this a try! 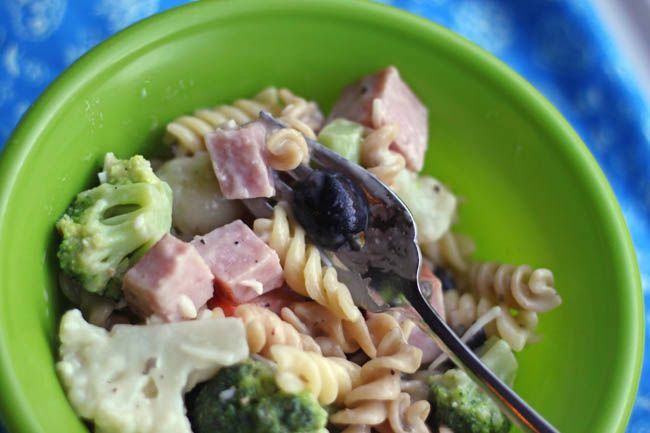 We LIVE on pasta salad for the summer!! I usually add left over BBQ chicken...or shredded chicken. The roasted chickens in the market work great too. Then I thrown in arti hearts, feta cheese, a little pesto from Trader Joes, shredded carrots (so I don't have to chop them) chopped & whole black olives that I just break in half, the frozen white corn from Trader joes, whatever Italian dressing I have left...then whatever else I have bit of in the fridge:) VERY easy...it is never the same salad twice!! How did you know I've been craving pasta salad??? I didn't realize that I had missed soo much over here. Really busy with ken and the hospital visit. I love your photoshoot--great pics. I'm inviting myself to the farm in the evening to catch fireflies (not today, just sometime...) lol! this looks really yummy!I'm Going to make it this weekend! We love any kind of pasta. This looks tasty...and easy is the only way I'll cook it. That Pioneer Woman is a fibber. :) Her stuff is not easy. That ought to tell you something about the way I cook. I don't mean to alarm you, but there are vegetables in that dish. Eeeewwwwww! Okay, there are some things I never outgrew.